Douglas DeVries appeared on Show 184, recorded in August 2008, at age 18. 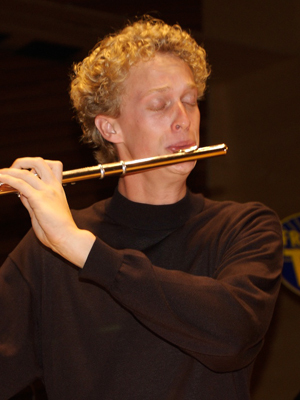 Douglas DeVries (Flute), 18, graduated this year from West Ranch High School in his hometown of Stevenson Ranch, CA. He initially began taking piano lessons from his grandmother, and eventually began playing flute when he was 12. Doug has played in many ensembles including the Claremont Young Musicians Orchestra, the Grace Baptist Praise Orchestra, and he was a singer in his high school choir. He is involved with his church and enjoys meeting up with his friends to do things like cook, play board games, or watch movies. Doug is a recipient of From the Top’s $10,000 Jack Kent Cooke Young Artist Award. Douglas is a Jack Kent Cooke Young Artist.